Disclaimer: The following post is nothing more than an excuse to talk about the upcoming movie, World War Z. Today is the last day of the 2013 Blogging from A-Z Challenge. Throughout the month of April, I featured some of my favorite speculative fiction books, as I ran through the 26 letters of the alphabet. By so doing, I have also discovered quite a few books I wouldn't have read otherwise. These books have covered the full spectrum of the genres under the speculative fiction umbrella, namely science fiction, fantasy and horror. The last book I'll be featuring is one that crosses the line between these genres and non-fiction. 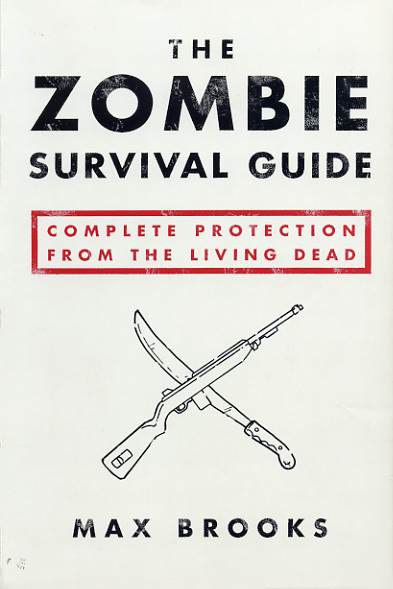 The Zombie Survival Guide is precisely what it claims to be: a practical handbook on how to survive in the event of a zombie apocalypse. It was written by Max Brooks, and published in 2003. Its pages are filled with what should be considered best practices in the wake of such a threat. Mr. Brooks lends the whole thing some credibility by ending with a chronological account of zombie encounters, hinting at the inevitability of an impending zombie outbreak. Following the publication and success of The Zombie Survival Guide, Mr. Brooks wrote a follow-up novel entitled World War Z. It was released in 2006, and it traces the events surrounding a ten-year global war with the undead. Unlike its predecessor, it was written with a much darker tone, but still manages to retain the former's humorous nature. In other words, even if you don't believe in zombies and such, these books are still worth checking out for their underlying humor alone. The last decent zombie movie from a major Hollywood studio (that I can think of) was Warm Bodies. So you can imagine my excitement when I first saw the preview for World War Z. The Brad Pitt produced movie is currently due for a midsummer release, and it stars none other than Brad Pitt himself. I think it is only natural for fans of the genre to celebrate its coming release, if only because it could bring to the genre the mass appeal that would ensure that more movies like this get made. And just in case you haven't seen it yet, I'll leave you with the awesome trailer that's got others like me clamoring with excitement. So many people have talked about World War Z I think this is a book I will have to read. I like the trailers, but I keep wanting to get a good look at their zombies. Me too. And in that regard, I really hope the movie doesn't go in the way of Battle: Los Angeles. Did you know the author is related to Mel Brooks? Really helped make the movie a reality. I don't believe being Mel Brooks' son had anything to do with it. In fact, Max had little to do with the making of the movie and I've gotten the impression he wasn't too thrilled with the outcome--fast-moving zombies, for one. I love the Zombie Survival Guide and I think the World War Z film looks incredible. Excellent theme and posts again this year Michael!!! Still haven't gotten around to either book, unfortunately. LOL. Hopefully, you'll both come to some form of agreement soon. That is a good book. A book I enjoyed of a similar nature is Field Guide to the Apocalypse. Thanks for the recommendation. I'll definitely be checking that out as well. World War Z looks truly amazing!! The Z trailer looks amazing! Not your typical zombie movie Michael. Yep. I really hope the actual movie lives up to expectation. FWIW, Max Brooks never intended for this book to be humorous. If you do a search, you'll find interviews where he indicated that he was dead serious (pun intended?) about the subject matter, though he supposedly had HIV in mind while he was writing it. It makes more sense when you read his words.